Electronic and Digital systems may use a variety of different number systems, (e.g. Decimal, Hexadecimal, Octal, Binary). In the above, dn-1 to d0 is integer part, then follows a radix point, and then d-1 to d-m is fractional part. How to convert a number from one base to another? 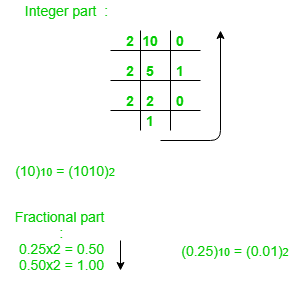 Note: Keep multiplying the fractional part with 2 until decimal part 0.00 is obtained. Note: Keep multiplying the fractional part with 8 until decimal part .00 is obtained. 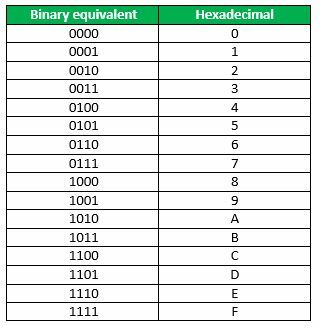 To convert from Hexadecimal to Binary, write the 4-bit binary equivalent of hexadecimal. To convert from Binary to Hexadecimal, group the bits in groups of 4 and write the hex for the 4-bit binary. Add 0's to adjust the groups. This article is contributed by Kriti Kushwaha.